Halloween and Friday the 13th are two days considered to bring about bad luck. For each of the two days, different beliefs and superstition cases surround them. The beliefs vary from nation to nation or region to region, and even though they are all considered bad omen, a great number of individuals cannot explain the difference between the two days. This post seeks to set the differences between the two days. The post brings out the variances based on different aspects including meaning, origin, activities, and reasons behind each. For an analysis of the different aspects, read through to the end. Halloween is a celebration that happens on the 31st day of October of every year in a number of countries. It is mainly observed by Western Christians as well as non-Christians around the globe. It is observed as the eve of the Western Christian feast referred to as All Hallows’ Day. When it rolls, it marks the beginning of the three-day Allhallowtide observance. The Allhallowtide observance is a time in the liturgical year and is dedicated to a remembrance of the dead. Among the dead souls remembered include the martyrs, saints (hallows), as well as all the faithful who have departed. Halloween is also called Hallowe’en, All Hallows’ Eve, All Saints’ Eve, Hallow’s Evening, or Allhalloween. Most Halloween traditions are said to have originated from ancient Celtic festivals that were believed to have pagan roots. The festivals included the Gaelic festival known as Samhain. Some people also believe that Halloween’s origin was a Christian holiday that was different from the ancient festivals like Samhain. Christian observations of All Hallows’ Eve are characterized by different activities. They include lighting candles on the graves of the dead and attending church services. Friday the 13th, in Western superstition, is considered an unlucky day. In the Gregorian calendar, it occurs when the 13th day of the month falls on a Friday. The occurrence happens at least once a year on the Gregorian calendar. However, it can also occur up to three times in one year. An example of multiple occurrences is the year 2017 where it occurred on January the 13th and October the 13th. The day also occurred twice in April and July 13th in 2018. Until 2020, Friday the 13th will occur twice each year but once in 2021 and 2022. 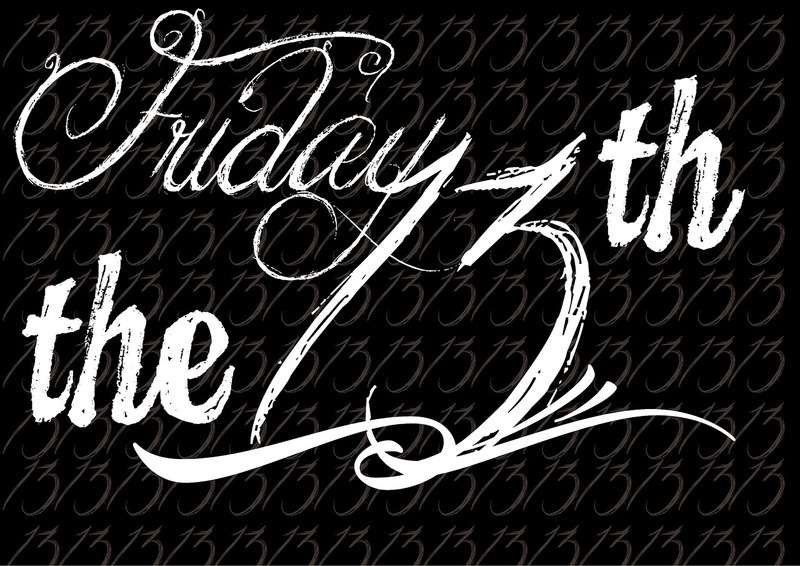 The superstition surrounding Friday the 13th may have originated from the Middle Ages. It is believed to originate from the story of the last supper and the subsequent betrayal and crucifixion of Jesus. The number 13 comes from the number of attendees in the Upper Room on the 13th day of Nisan Maundy Thursday. This was the night before Jesus died on Good Friday. Halloween is believed to originate from the feast All Hallows’ Day where it has been used to mark the beginning of three-day observance of Allhallowtide. Friday the 13th, on the other hand, originated from the story of Jesus, the last supper, and His subsequent crucifixion. The Halloween day dates back to around 1745 and has a Christian origin while Friday the 13th dates back to the Middle Ages and originates from the story of Jesus Christ, the last supper, and His subsequent crucifixion. The Halloween day is marked on the 31st day of October every year while Friday the 13th can occur once, twice, or even thrice a year. The latter is characterized by the occurrence of date 13th whenever it falls on a Friday regardless of the month. 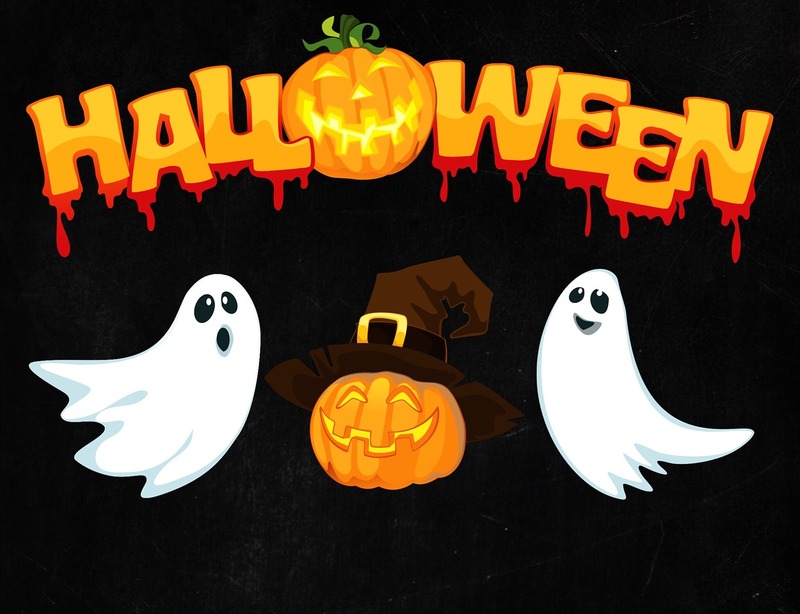 The Halloween day is marked with a variety of events and activities including carving pumpkins into jack-o’-lanterns, attending Halloween costume parties, playing pranks, telling scary stories, and watching horror movies. On the other hand, Friday the 13th is not characterized by activities. Rather, the day has seen people getting more inclined towards staying away from activities and events they believe are causes of bad omen. Both the Halloween and Friday the 13th days are associated with evil occurrences that happened in the past. Even though the days are marked differently, most people believe they are carriers of bad omen. As a result, a good number of people avoid doing anything they believe will bring bad luck to them on either of the days. However, the days are different based on several aspects. A case to point out is about the activities that people get involved in during Halloween, yet they avoid most of them on Friday the 13th. Sarah Brown. "Difference Between Halloween and Friday the 13th." DifferenceBetween.net. 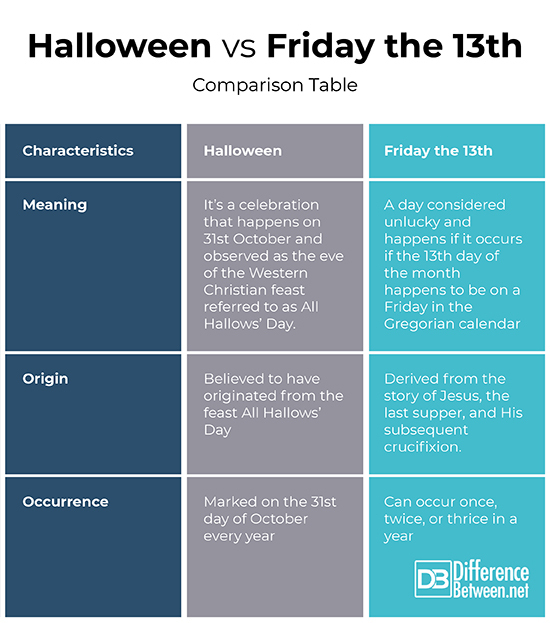 November 12, 2018 < http://www.differencebetween.net/miscellaneous/difference-between-halloween-and-friday-the-13th/ >. "Friday The 13Th". Timeanddate.Com, 2018, https://www.timeanddate.com/holidays/world/friday-13. Accessed 29 Oct 2018. "Friday The 13Th". HISTORY, 2018, https://www.history.com/topics/folklore/friday-the-13th. Accessed 29 Oct 2018.